Everyone scans the sky on Christmas Eve hoping to see reindeer fly. Image measures approximately 2-3/4" X 2-3/4". This original design by Fran Seiford is deeply etched and precision cut from premium gray rubber on a 1/8" gray rubber foam backing then mounted on a cling vinyl decal with full sized image for easier storage and use with an acrylic handle sold separately. Made in the USA. A classic, vintage Santa is on his way, pack on back, to make your Christmas merry! Image measures approximately 4" X 5-1/4". This original design by Fran Seiford is deeply etched and precision cut from premium gray rubber on a 1/8" gray rubber foam backing then mounted on a cling vinyl decal with full sized image for easier storage and use with an acrylic handle sold separately. 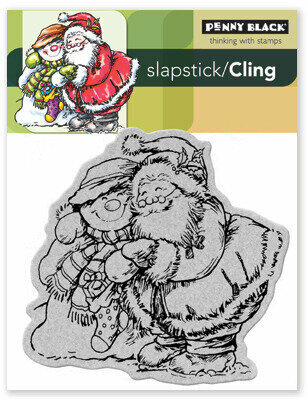 Christmas themed cling stamp featuring Santa Claus, Mrs. Claus, and "Merry Christmas". Mudpie is putting Santa Hats on all his friends. Image measures approximately 2-3/4" X 4-1/4". This original design is copyright Ellen Jareckie and House-Mouse Designs. The image is deeply etched and precision cut from premium gray rubber on a 1/8" gray rubber foam backing then mounted on a cling vinyl decal with full sized image for easier storage and use with an acrylic handle sold separately. Made in the USA. This clear stamp set features your favorite dogs for Christmas! Featuring Pug tangled in lights, Chihuahua in a Santa sweater, Retriever with a candy cane and Santa clothes, Dachshund in a sweater, quintet of caroling dogs, paw stocking, bone with a bow, paw print ornament, and sentiments "Dear Santa, please don't bring me any cloths." "Dachshund though the snow" "Merry Christmas from the dog" "Here comes Santa Paws" "Deck the halls with bow wows!" "Happy Howl-idays!" Set of 14 clear stamps. From Art Impressions, this set of unmounted stamps features Santa Claus and Mrs. Claus with the sentiment "Twinkle In A Tangle". 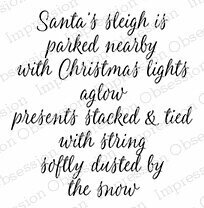 Cling Stamp from Impression Obsession featuring the rhyming sentiment "Santa's sleigh is parked nearby with Christmas lights aglow. Presents stacked & tied with string, softly dusted by the snow." This traditional Christmas clear stamp set features Santa with a bag of presents, two snowmen nuzzling noses, a candy cane with holly and a snowflake. "Ho!" "Cold noses warm hearts" "Wishing you the merriest of Christmases!" 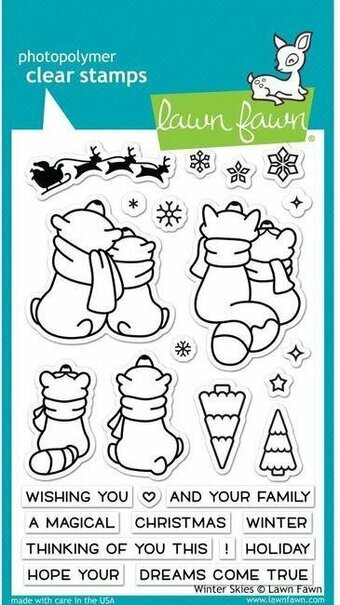 "I've got you to keep me warm"
Christmas themed clear stamps from Picket Fence Studios featuring Santa Claus and penguins. Unique, beautiful and creative stamps designed by Nicole Petersen. Use with paints and inks. Perfect for card making, journaling, scrapbooking, and mixed media. Clear stamps from Picket Fence Studios featuring reindeer and Christmas sentiments. Unique, beautiful and creative stamps designed by Nicole Petersen. Use with paints and inks. Perfect for card making, journaling, scrapbooking, and mixed media. Cling Stamp from Impression Obsession featuring the sentiment "Santa Baby: hurry Down the Chimney Tonight". Create a Santa with arms and legs that wave up and down with this new addition to our Flutters line! Includes stamps and dies for Santa, arms, and legs, and a set of 10 brads to get you started. "Get your jingle on!" Instructions included. Sassy is a state of mind and this spirited St.Nick epitomizes that feisty feeling. Take your pick from the two jolly elves - one with his pack slung jauntily over his shoulder and the other seemingly surveying his Christmas Eve handiwork. An overflowing sleigh and seven cheery sentiments complete this set. Mix and match these images and greetings with those found in the complementary Santa & Friends set for even more scene-stealing possibilities! Clear stamp sets include the name of the set on the sticker for easy identification. Our clear stamps and Die-namics are made in the USA. 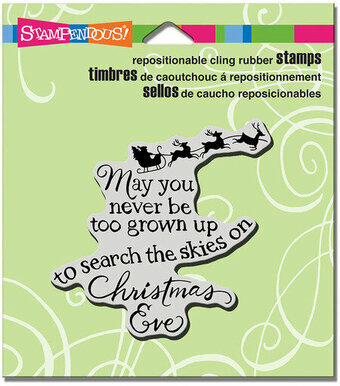 Cling Stamp from Impression Obsession featuring the sentiment "Here comes Santa Claus, right down Santa Claus lane". Santa wouldn't be where he is without the help of some very important friends. Celebrate Dasher and Dancer and Prancer and Vixen... Comet and Cupid and Donner and Blitzen (and don't forget Rudolph!) by stamping a team of essential reindeer companions for our cherished old elf. Also included are four coordinating greetings and holly accent images. Clear stamp sets include the name of the set on the sticker for easy identification. Our clear stamps and Die-namics are made in the USA. Magnolia Stamps are perfect for scrapbook layouts, handmade cards and mixed media projects. Stamps come trimmed and ready to go with EZMount. Just adhere to any acrylic block, ink and stamp! These are imported from Sweden and very popular with stampers. 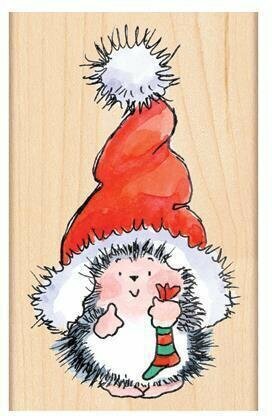 A Christmas-themed Penny Black wood stamp featuring a hedgehog wearing a Santa Claus hat. Cling stamp from Stamping Bella featuring Santa Claus, Santa's sleigh, and reindeer. 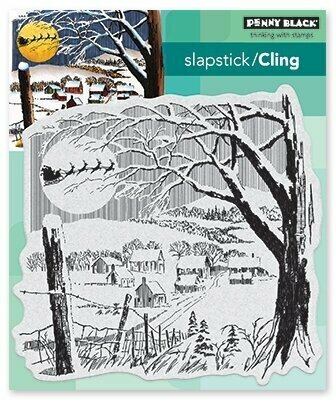 Christmas themed Penny Black Slapstick cling stamp featuring Santa's reindeer and sleigh flying over a village. Tim Holtz Cling Mounted Stamps: Tattered Christmas. Nineteen deeply etched red rubber cling mount rubber stamps that adhere to any clear acrylic block. 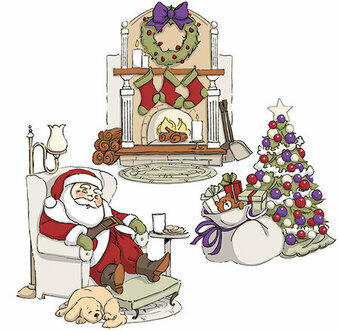 Santa (upper right) measures approximately 2 1/16" x 1 15/16", snowman measures approximately 1 3/4" x 2 3/8". Stamps come on a 3-hole punched sheet for easy storage. This clear stamp set celebrates a warm-weathered Christmas with a Santa in board shorts, Santa "Claws" crab, starfish donning scarves, jingle bell flip flops, and a decorated palm tree. "Warmest wishes for a joyous Christmas!" "Here comes Santa Claws!" Add a rustic, warm touch to all of your holiday pages, cards and projects with the traditional, nostalgic patterns of Mad 4 Plaid Christmas. Polymer stamps featuring Santa Claus, a reindeer, a Christmas Stocking, "25", "Naughty", "Nice", and more. "May the magic of Christmas be yours!" 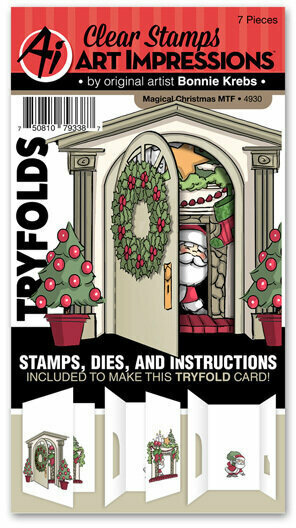 Reveal Santa coming down the chimney in this Mini Tryfold featuring a door, fireplace complete with stockings, Santa, and a wreath. Dies cut the opening to reveal the images behind, including die that cuts and scores the door with a hinge! Contains a 5 piece clear stamp set and 2 piece die set. 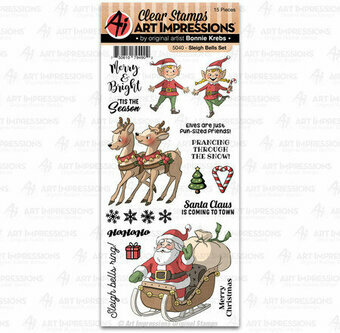 Clear stamps from Memory Box featuring Santa Claus, Santa's Sleigh, Reindeer, and a Chimney. 4 x 6 inches clear stamp set. 18 clear stamps included. 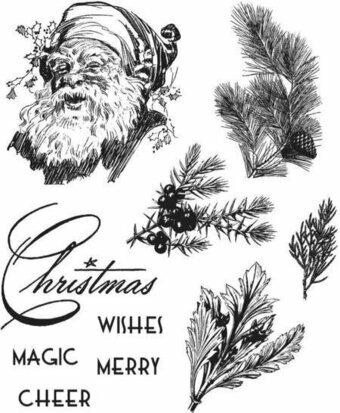 Christmas themed Art Impressions unmounted rubber stamp set. Christmas themed cling stamp from Stamping Bella featuring Santa Claus, Santa's Sleigh, and Reindeer. Christmas themed cling stamp from Stamping Bella featuring Christmas Stockings and garland for a fireplace mantle. 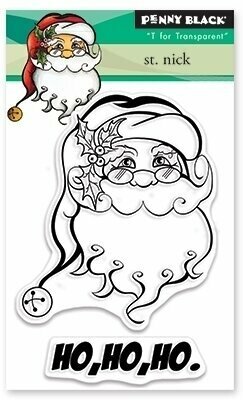 Christmas themed Tim Holtz Cling Stamps featuring Santa Claus, Christmas carolers, a wreath, holly, and more.